I found some Garcinia benthamii (in the Kandy Botanical Gardens in Sri Lanka) in the summer of 2011. I was aimlessly wandering about the Garcinias when I caught a whiff of a lovely scent. It was similar to the scent of apples but with other floral overtones. The odor lead me to a tree that had a huge number of fruits dropped at its base. The fruits all looked like little pomegranates. When it came time to start eating them I found that they were too acid for casual eating (I think they could eat the enamel off ones teeth), also they have a strange sticky substance right next to the seed that is annoying. That being said the rest of the flavor was quite nice. It was like mangosteen except instead of the plum-like flavors they were replaced with apple/crab apple like flavors. I think if the acid level was reduced (they had sweetness, but just too much acid), and less of gummy substance then they could be a nice commercial fruit..
One odd bonus of them was that the rind was quite fragrant and could be used as a potpourri. What's that got to do with Jose Andres $10 brussel sprouts? Thanks for the good description. Here in Uganda we got Garcinia buchananii; one of several Garcinia species edible but slightly acid. In my perspective better than G. livingstonei but not yet a top species. I always heard Imbe was a quite nice fruit... so I'd think G. buchanaii would be really good (if it is better than Imbe). Hopefully, one day I'll try both of those. Africa seems to have lots of interesting fruits, one day if I'm lucky I'll be trying them. Looks very similar to what I had. I ate several segments and flavorwise I thought they were great, just way to acid. But they had sweetness, lytchee like flavors, and apple / crab apple like flavors. Mine had FALLEN from the tree and yours seem to be cut off. So maybe yours aren't at peak flavor as a result. Also, even if what we had is the same species (and it seems that way based on the photo) there could be genetic differences / growing differences that cause the flavor to be different. And there was that weird gummy substance on the surface of the seed that stuck to just about anything. They are smaller than mangosteen, that's for sure. I have a tree of Garcinia benthamii. 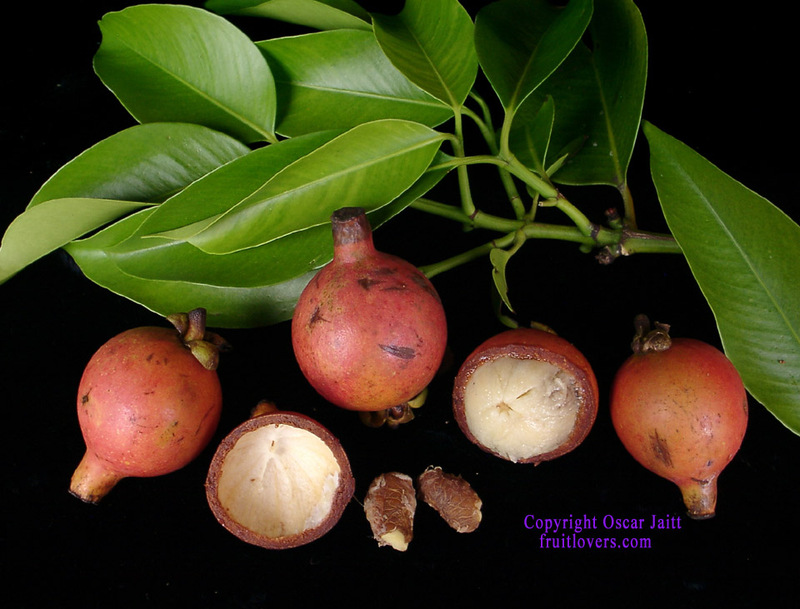 The fruits and tree is very similar to seashore mangosteen, Garcinia hombroniana. I think that benthamii is not as sour as the hombroniana. Benthamii has a mix of sweet and sour flavors. I find them enjoyable. You're right... I never remember the name of that garden and as it is not exactly in Kandy I should use the name. It was an amazing garden. They did have one whacky mislabled tree it was an ackee that was labled something like Tripterodendron edulis. I tried to contact them about that but never got a good email for them. Oscar, sounds like you have a better "variety" of this fruit. The ones I had were eating the enamel off my teeth. I am much more tollerant of sourness in fruit than most people (I actually enjoy eating Phyllanthus acidus and several other fruits that most people find too sour), so if it is too sour for me its too sour for 99% of people. The ones I had were WAY more acid than even the most acidic of Santols. Do you have the one tree or several? As I have just one tree which makes only female flowers, very occasionally it will set a miniature seedless fruit which will ripen and is pleasant in taste, just not much of it as these fruits are only an inch in diameter.